Historical novelist Massie unrolls the familiar knightly yarns with some fresh, unusual twists. 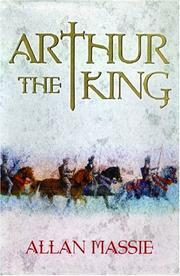 Offering a vaguely postmodern take not merely on Arthur himself but on the whole of British history, the author picks up his narrative thread where he left it dangling in The Evening of the World (2003). Noble legionary Marcus, having subdued the warring tribes of Britain into a peaceful outpost of the Empire, returns to Rome on a quixotic mission to save the Empire itself, which is collapsing before the barbarian hordes. Upon finding that the Empire has been usurped by a cabal of upstart bishops (i.e., the popes), he dies a broken man, and Britain reverts to civil war. Marcus’s son Uther Pendragon keeps a precarious hold over his father’s erstwhile subjects, but he is beset by squabbling Picts, Saxons, and Caledonians who unceasingly challenge his rule. When Pendragon dies, his will stipulates that the next king shall be whoever draws his sword Excalibur from its rocky sheath—and that, of course, turns out to be the lad Arthur. But who is Arthur, and where did he come from? The answer lies with Merlin, Marcus’s shadowy adviser, who sees to the boy’s education and presents him to the Court, as it were. Most readers know the story already, so suffice it to say that all the familiar faces—Guinevere, Lancelot, Gawaine, Mordred, and Morgan le Fay—are here, although the relations between some of them are not quite what you would expect. And, naturally, there are more than a few unanswered questions at the end. Some will quibble at the Da Vinci Code–like deconstruction of papacy and Church, but most will applaud a brisk, elegant narrative free of the New Age gibberish that infects most modern Arthurian sagas.